A Learning Management System is easily defined by breaking down the term. An LMS is simply a system that allows instructors to manage student learning. What differentiates one LMS from another is only a matter of how well they do this. Converge LMS is a learning management system that has been designed by teachers specifically for the K12 classroom. This means the features and user interface of Converge were created with K12 classrooms and students in mind. Google Classroom has become increasingly popular in secondary schools, and even some elementary schools, as a way to deliver course content. And it’s easy to see why – Google is now a verb, and anything associated with Google warrants a second look. However, Google Classroom itself does not even claim to be an LMS. According to their website Google Classroom is a “free suite of productivity tools that includes email, documents and storage”. Essentially, Google has leveraged their existing tools like Docs, Gmail, and Drive, and housed it in one place for convenience. And that’s all lovely, but it’s not an LMS. When schools are ready to move to a 1:1, 21st Century virtual learning environment, they need one that provides a full set of features to allow them to maximize student learning potential and opportunities, not a productivity suite. A full featured LMS like Converge offers instructors, administrators, and parents many benefits that Google Classroom cannot deliver – tools that all stakeholders deserve. Converge has a fully functional gradebook that allows teachers to monitor student progress. Teachers are able to monitor an individual student’s grades, as well as average grades for assignments, categories, and courses. The Converge gradebook also has customization options to allow teachers to color code the gradebook, or change the grading scale. A full featured gradebook that allows teachers to monitor progress and course goals is essential for informed decision making in the classroom. Teachers deserve the ability to access high quality data to inform their praxis. Google Classroom does allow teachers to grade assignments, but does not compile this data in any sort of gradebook. In addition to the gradebook, teachers and administrators using Converge also have access to system wide analytics. 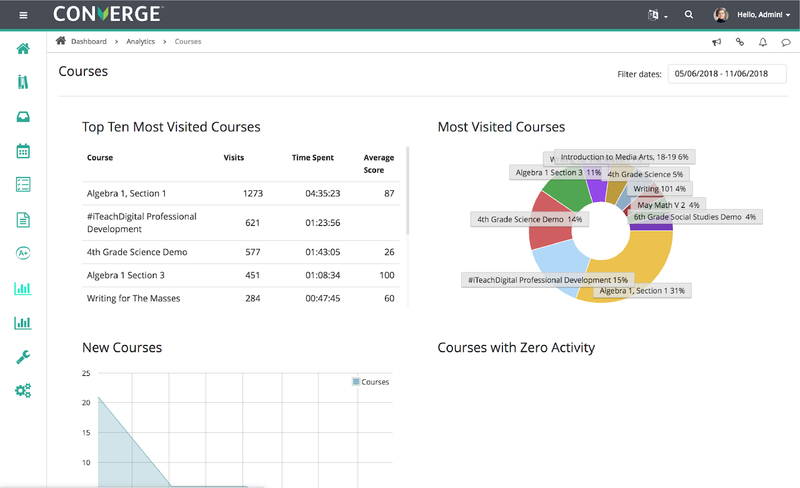 These analytics include metrics like most active courses, student time spent logged in, and even the OS and web browser being used to access Converge. Instructors and administrators can also track system level cohorts of students such as ESL groups, or Gifted Students to insure that all students’ needs are being met. All of this data allows school administrators to make system wide decisions using a wealth of metrics that are available to them. Access to system level analytics for administrators means that every step of the educational process can be made using powerful data. Google Classroom does not offer any analytics tools at the system level, but simply allows administrators to go in and view courses. Aggregating this data is essential for busy policymakers. Converge allows access to important information for another essential stakeholders in a child’s education – their parents. Parents in a Converge school are actually given their own Converge accounts and login credentials, which are connected to their student or students. From there, they can directly communicate with teachers, see their student’s grades, and view upcoming due dates on the Converge Calendar. Parents can even review the courses their student is enrolled in and peruse instructional materials. All of this means that parents are able to be fully involved in their child’s education – a proven factor in student success. Google Classroom only allows teachers to send email summaries that show missing and upcoming work. While this is important, it’s only a small piece of the puzzle for parent involvement. Converge allows parents to connect directly to their student’s virtual learning environment, access both parents and students deserve. Collaboration skills are one of the pieces of the 21st century learning framework, and it’s not just essential for students – teachers should be able to collaborate, too. Converge contains a powerful quiz feature, one that includes the ability to create categories of questions, and share those questions amongst teachers in a school or district. This allows teachers to share high quality content and create common assessments if needed. Teachers can then reuse or modify any question in their question bank with ease. Google Classroom does not offer a quiz tool, but does allow teachers to use Google Forms. Google Forms questions cannot be reused or shared in any way. Additionally, data from a Google Form is housed in a Google Sheet, and not aggregated in any sort of gradebook. The shared question bank and quiz feature in Converge allows teachers to collaborate to create quality formative and summative assessments, then share and leverage the data provided from these. That’s the whole point of assessing, right?! 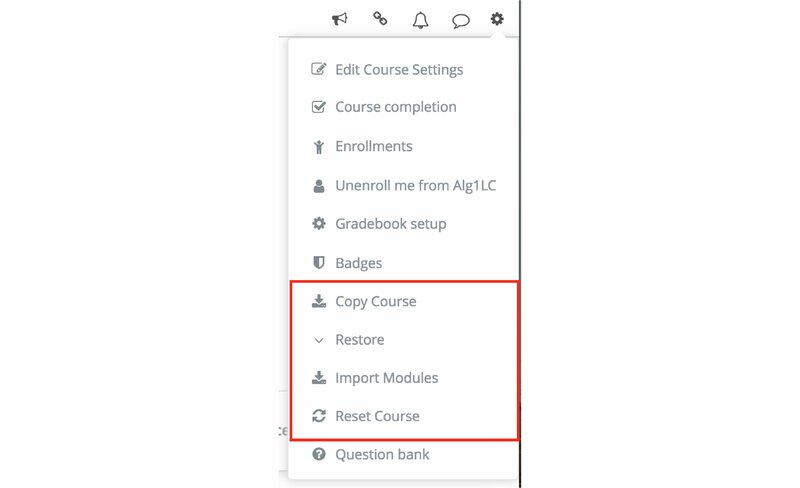 One of the biggest ways that Converge makes the lives of instructors easier is by allowing them to copy and reuse courses. Teachers can create copies of their courses for new instructors within their school or district to ease transitions, or wipe the course of student data and reuse it for the next school year while maintaining the existing quality content. Teachers also have the ability to copy individual assignments and modules (or “Units”) to other courses within Converge. All of these features were designed with the busy teacher in mind. Google Classroom has recently created functionality that allows teachers to copy individual assignments to other courses, but that’s all they offer to their teachers. Another benefit that sets Converge apart, not just from Google Classroom but from many other LMSs, is the dedicated support team. Converge offers all users – admin, instructors, students and parents – access to an ever-expanding bank of video and PDF tutorials to provide instructions on using Converge’s rich features. All users also have a direct line to the Converge team using the Help widget directly on the Converge page, or by visiting the help desk website. The Converge Support Specialists have a record of rapid response to any any support inquiry. Because Converge is a dedicated LMS, the team is also able to respond to feedback and suggestions in a more timely manner, and even conducts meetings and roundtable discussions with users to drive future development. Google Classroom does not currently have a help desk feature, only a forum for their users to seek help from each other. Crowdsourcing is a great solution to some problems, but Converge believes their users deserve a dedicated team of experts to answer their questions. As you evaluate the sea of content and learning management systems, consider your goals. If your driving factor is budget, then Google Classroom might be the first option for you. However, if you want the best outcomes for your students, powerful data, and ease of use for everyone involved in the educational process, consider the advantages of an LMS built with you and your students at the heart of every moving part. Take a look at Converge Learning Management System! Ready to learn more about Converge LMS? Check out our website or schedule your personalized demo today!